It is a great relief that Homo naledi, a most curious critter, was announced to the world on Thursday. I’ve been working on these fossils since May 2014, and it was really hard to keep my trap shut about it for over a year. 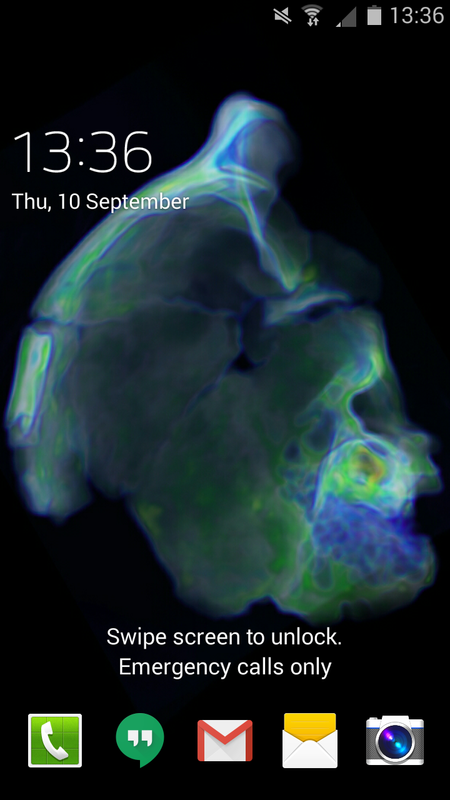 Homo naledi on my mind, and the lock screen on my phone, all year. CT rendering of cranium DH3, top is to the left and front is to the top. I was in London for the ESHE conference last week when **it hit the fan, and so I got to attend a small press conference from the paper’s publisher, eLife, for the announcement. eLife press conference last Thursday. 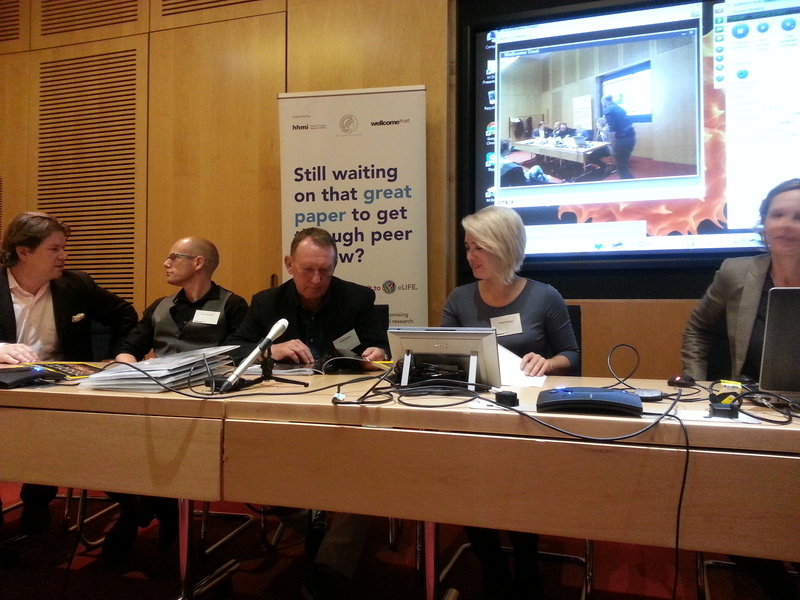 From left to right: friends and colleagues Will Harcourt-Smith, Matthew Skinner, Noel Cameron, Alia Gurtov and Tracy Kivell. I had just flown in from Kazakhstan, and was presenting some recent work on the evolution of brain growth (I’ll write a post about it soon, promise), so it was a bit hard to appreciate the gravity of the announcement. Although the awesome spread in National Geographic did help it sink in a bit. 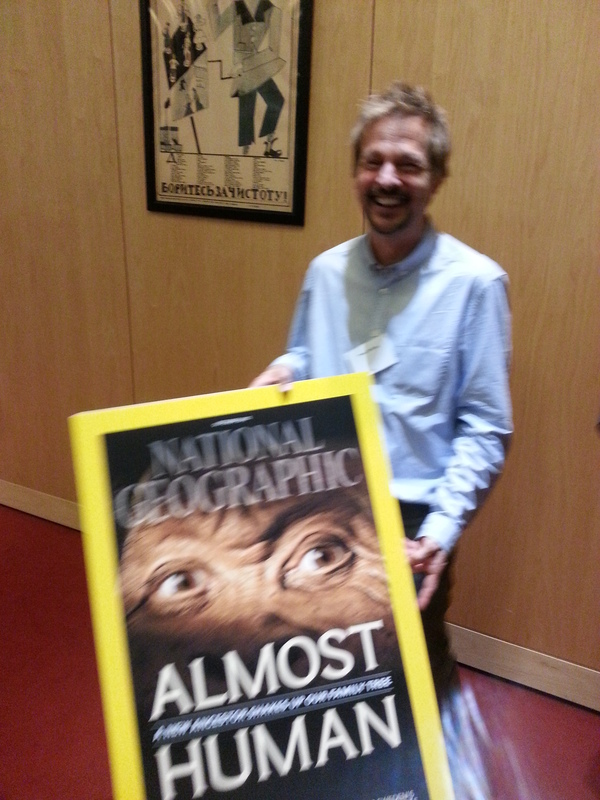 Really blurry photo of Markus Bastir holding up the heaviest copy of National Geographic ever. I’m wending my way back to Kazakhstan now, but in the coming weeks I will try to post more about these fossils, the project, and specifically what I’m working on. Until then, I’d like to point out how much information is freely and easily available to the entire world about these fossils. The paper, full-length and filled with excellent images of many of the specimens and reconstructions, is available for free online here. In addition, you can download 3D surface scans of over 80 of the original fossils on MorphoSource, also totally free. Everything about this scientific discovery and its dissemination is unprecedented – the sheer number of fossils and the ease of access with which literally everyone (well, with an internet connection) can access this information has never occurred before. This is the way paleoanthropology should be. Hats off to Lee Berger and the other senior scientists on the project for making such a monumental resource available to all.